Want to hear about the latest in business & first class? I was very honoured recently to be invited to be interviewed by John Walton, Deputy Editor of industry passenger experience publication and podcast Runway Girl. I am a big fan of John and his breadth of knowledge of the airline industry including having previously worked at Australian Business Traveller. For Runway Girl, John writes the Opinion and Analysis section of RGN called Up Front. He specializes in cabin interiors, seating, connectivity, and premium class service. If you fancy hearing us discuss the world of luxury flying you can have a listen here. The service will be done all as one, there will be no separate drinks rounds on longer routes which personally I find annoying as you will probably have to wait much longer to get a drink initially as you wait for the food to heat. Apparently, it is to ensure consistency across all the routes. Everything will be on your tray even on long routes including the main course. The dishes will be smaller to accommodate this and your wine glass will also be on the tray already along with the cutlery. Except on the longest bands which have the same meal from 10.00 onwards. I am hoping to squeeze in a Club Europe flight in the next few weeks to give you a full review. Etihad sale prices aren’t fantastic from the UK compared to an ex EU on Qatar but in the absence of those offers, it may be worth a look if you fancy trying Etihad in the near future. If you are booking for more than 6 months time I would wait as most of these fares are more than some previous sales and sometimes they drop the prices a few days in. I do like the price of the Phuket and Kuala Lumpur flights as these are mainly cheaper than most of the other premium airlines but without the hassle of an ex EU. Prices vary between London and Manchester but are generally very close apart from the one exception I have noted. 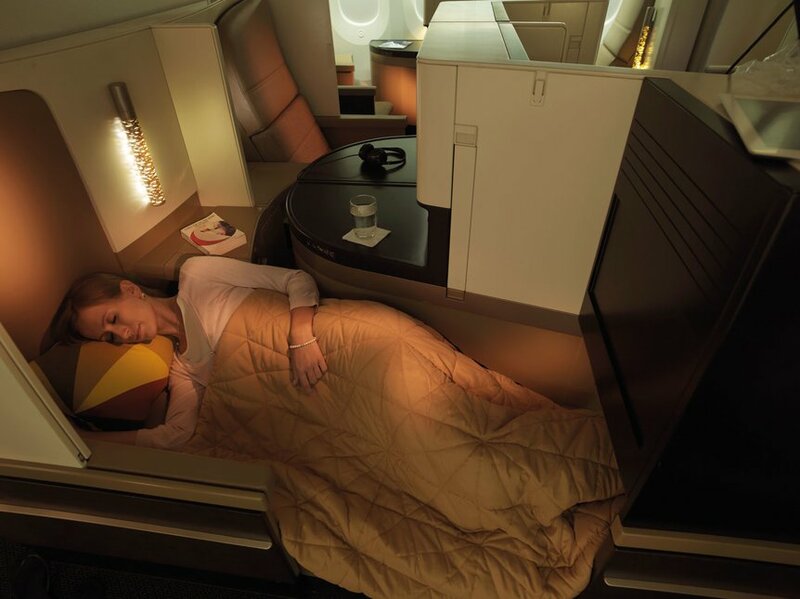 Etihad’s best seats, the new Business Studios, are available on the A380 and B787 Dreamliners at the moment. Fortunately, the London to Abu Dhabi route currently has the A380 but Manchester only has the B777 with the older business class. 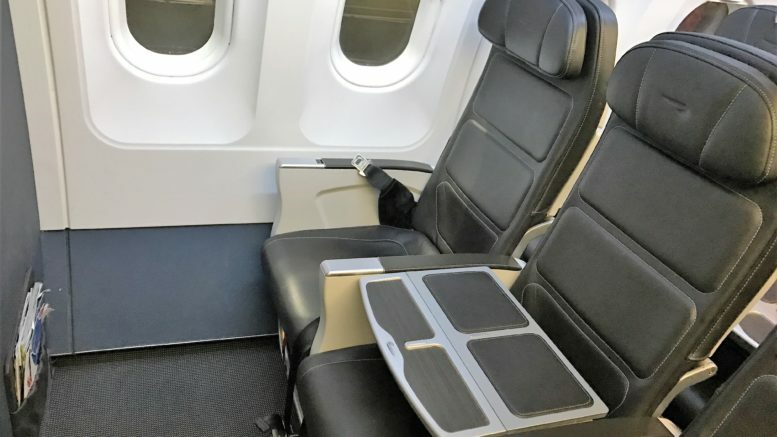 The Business Class Studio features a 22-inch wide seat that converts into a fully-flat bed of up to 6 feet and 8 inches. Each seat has direct aisle access, unlike British Airways. You can read my review of the Etihad business studio here. The rest of Etihad’s fleet offer their older business class which still has fully flat beds. Credit miles: Air New Zealand, Alitalia, All Nippon Airways, American Airlines, Asiana Airlines, Czech Airlines, Etihad Airways, Garuda Indonesia,Hainan Airlines, Jet Airways, Korean Air, Malaysia Airlines, Oman Air, Philippine Airlines, Royal Air Maroc, SAS Scandinavian Airlines, South African Airways, Sri Lankan Airlines, Virgin Australia. You can find the Etihad sale page here. 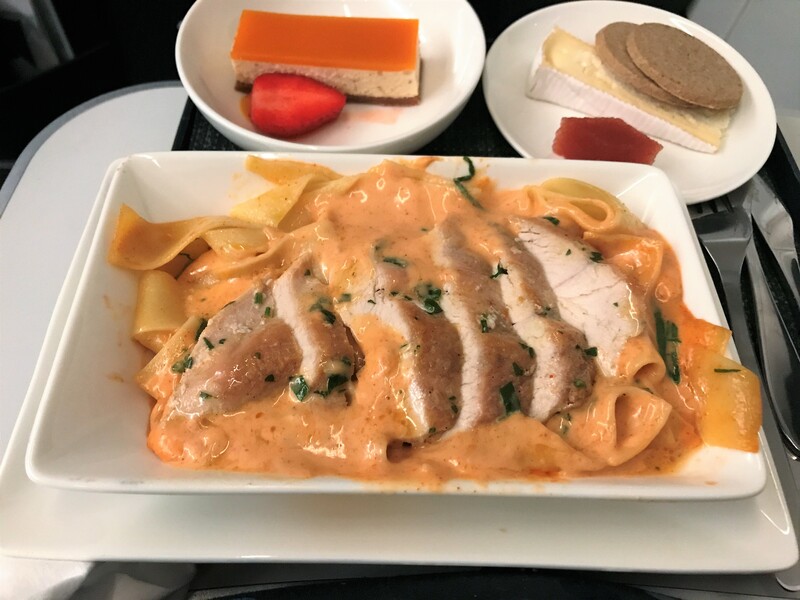 10 Comments on "News & offers: Details on new Club Europe meals, Etihad business class sale & listen to me discuss business & first"
What’s with the crazy ice proposition? Who wants a G&T without ice & a slice? Personally I don’t want a warm sparkling water without either. On a longer route a pre-dinner drink is preferable! Again, who are they asking? The ice is all down to the wine glasses before being used for most drinks which obviously hold less. It is due to storage capacity I believe. I always make sure I give the full order anyway such as sparking water with ice no lemon etc as saved time. BA is getting worse and worse. Aged 747 and 777-200 fleet (average 16 years) No direct aisle access in Club World, lack of Wi-Fi on board most aircraft’s, old fashion IFE an now shrinking in on Club Europe service. Compared to other airlines in the Oneworld alliance, its on the bottom line. Seriously, who cares about food on board? Any airport restaurant serves a better meal. Hi TLFL, could you offer a little bit more guidance on the branding of flights please? For example my wife and I and flying to Barcelona in October in Club Europe. From what I read this is a Band 3 flight I think. What do you think this will mean in terms of catering for this flight or similar flights. Thank for your help and the articles you write, don’t fly too regularly but enjoy reading them nonetheless. Hi. At the moment we don’t know exactly what each band gets but I will shortly publish which routes are in which bands and what meals they will get.